LED share the only power source. components, form a complete control of pixel point. driver, ensure wave-form distortion not accumulate. 4. Built-in electric reset circuit and power lost reset circuit. frequency not less than 400Hz/s. 6. Cascading port transmission signal by single line. 9. Send data at speeds of 800Kbps. 10.l The color of the light were highly consistent, cost-effective..
11. Full-color module, Full color soft lights a lamp strip. 12. LED decorative lighting, Indoor/outdoor LED video irregular screen. 5050 components. It internal include intelligent digital port data latch and signal reshaping amplification drive circuit. ensuring the pixel point light color height consistent. The data transfer protocol use single NZR communication mode. 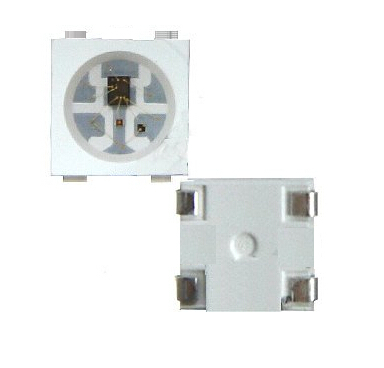 integrated in LED above becoming more simple circuit, small volume, convenient installation.